Dean Wesley Smith has a separate computer for writing. Neil Gaiman writes his books longhand. 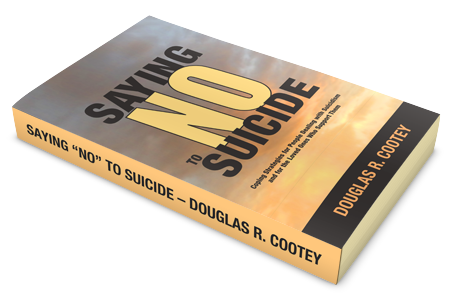 Writers who write professionally all find their own way to block out the distractions of this world to get busy creating their own worlds. You don't need ADHD to recognize that distractions cost you time and money. When I want to get busy writing without distractions, I use a Writing Room account. It's connected to the internet just enough to be useful, but not enough to be distracting. This differs from using apps that open to full screen because in this account, everything that I have purposefully designed to grab my attention is not installed. Text messages, upgrade prompts, alarms, and calendar events are all potential distractions awaiting their turn to pull me away from my work. 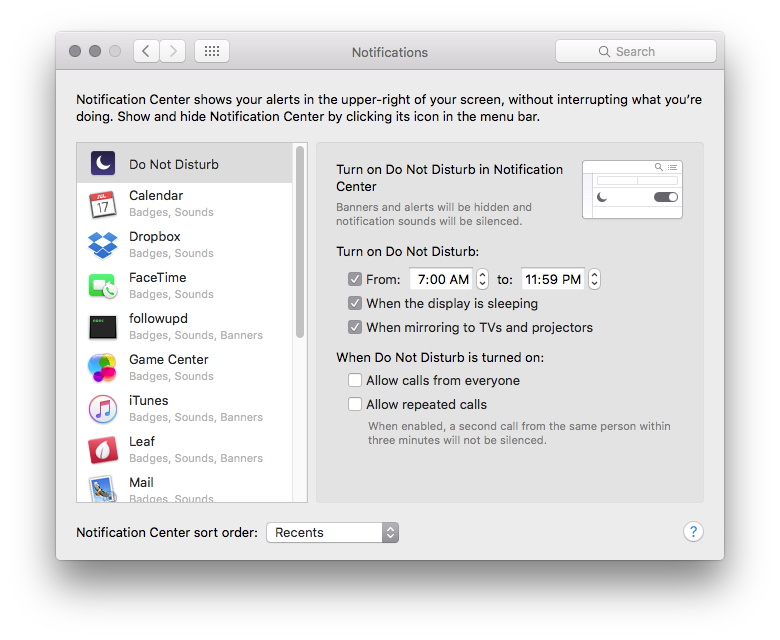 I recently set up a new distraction free user under El Capitan. This time, things where a little different than when I did it three years ago. There were some of the same old distractions like Twitter and Facebook, but also new ones that popped up like mushrooms overnight. Here are the steps I went through to create this distraction free user. 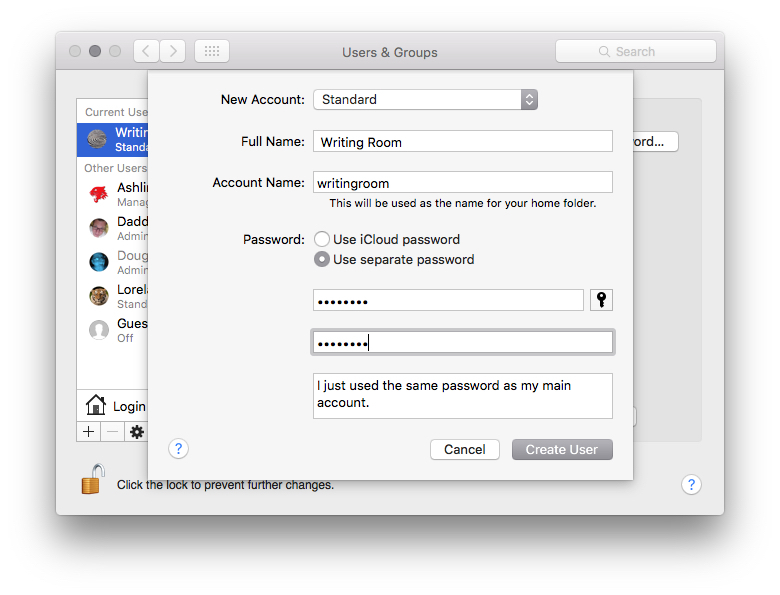 Open System Preferences and select the Users & Groups icon. Click on the padlock on the bottom left, and enter your password. Now click on the plus symbol just above the padlock to create a new user. I chose “Standard” for the account type. I entered the full name “Writing Room”, and let the short name be chosen by default. 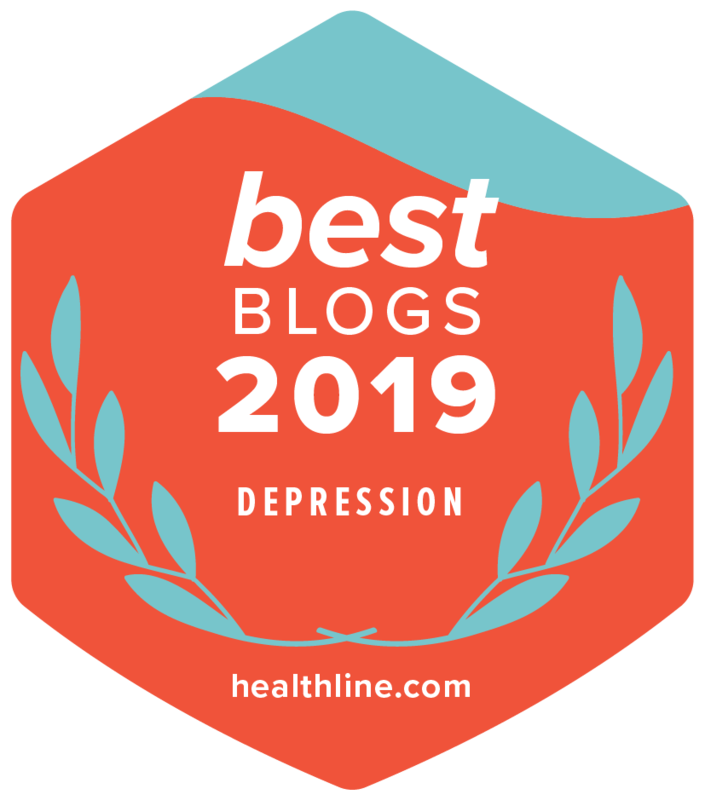 You'll hardly ever need it. Most importantly, you must select “Use separate password”. You don't want iCloud connectivity right off the bat because it will import all the cruft you're trying to escape from your main account. Select “Create User”. Now you're ready to log into that account. Once in, let's set the mood. Open System Preferences, click on Desktop & Screen Saver, and choose a simple or inspiring desktop. I opt for monotone, undistracting images with low contrast, but maybe loud and bright is more your style. While there, I opened the General preference pane and selected “Graphite” for the appearance. 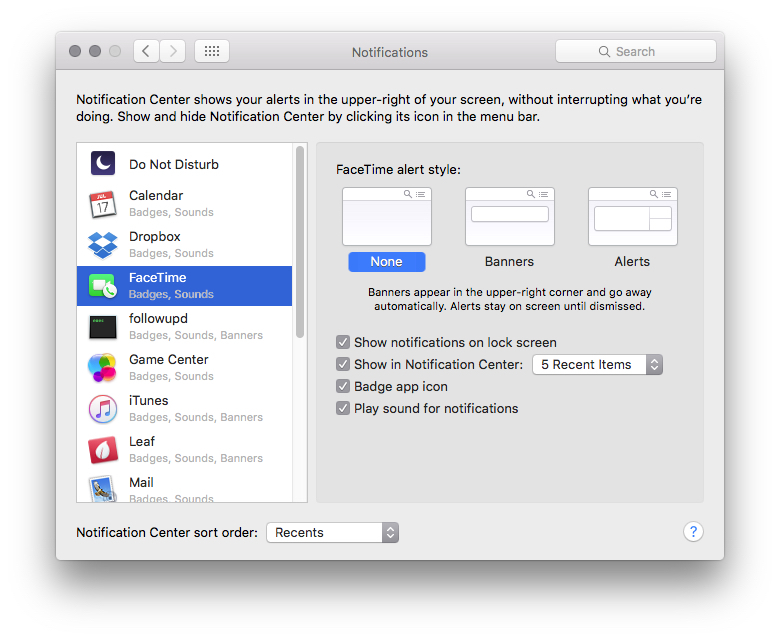 Hide, minimize, or close System Preferences for the time being. 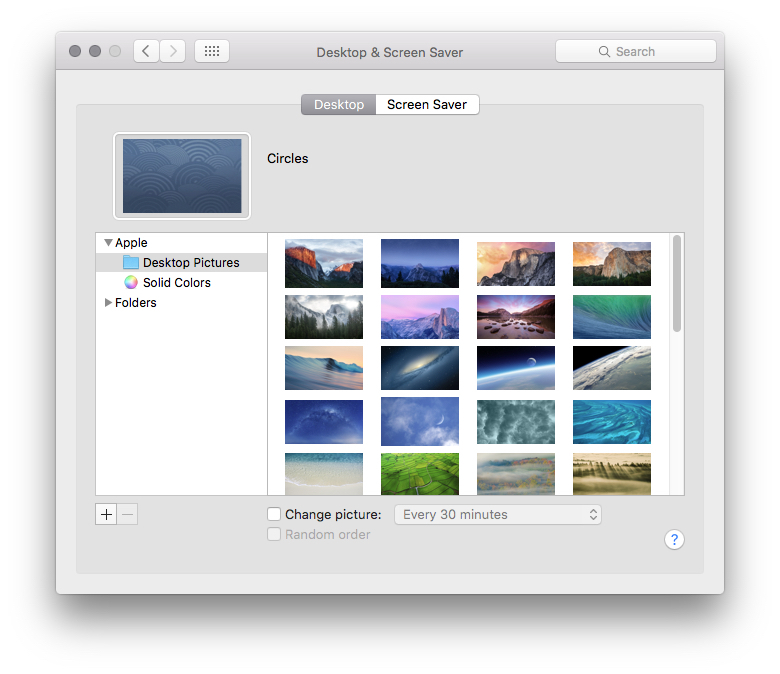 Click on your desktop to make Finder active. It should be the only app up for now. 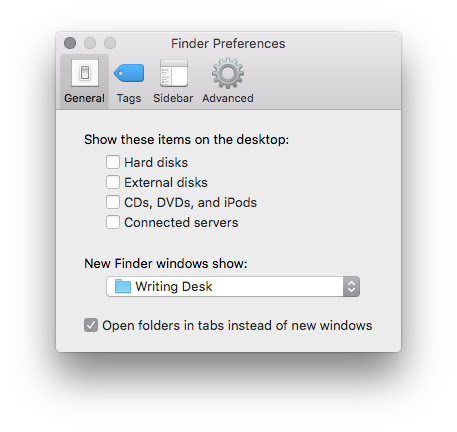 Press the Command & , keys (or select Finder>Preferences from the menu) to access Finder prefs. In the General tab, unclick all hard drives and servers. While still in Finder prefs, select the Sidebar tab. I checked all the hard drives here. When I'm ready for using Finder, I want all files accessible. Otherwise, it's just clutter. Close the prefs window. Now click on your Desktop, then press Control-J. This opens the prefs for your Desktop. I increase the icon sizes, leave “Show icon info” unchecked, but make sure to check “Show icon preview”. I also sort by “Kind”. Next, we will enable Dropbox, or the syncing folder service of your choice. I used to monkey around with sharing a Dropbox folder between my main and writing account, but there were so many permissions headaches. Since my Dropbox is only 8gb of space, I just let it mirror the data in my user's home folder with the default setting. Open your Dropbox folder. Click on the Dropbox icon on the middle top of the Finder window, then drag the icon to your dock. I have a folder inside Dropbox for all my writing, so I use that. I also drag a copy to my Desktop. Now that Dropbox is set up, open finder prefs and change “New Finder windows show:” to your Dropbox writing folder. Close Finder prefs, then click on the Finder face in your dock. Press Control-J and choose how you want your Finder windows to sort. I opt for arranging and sorting by Name. Click on “Use as Defaults”. This will force all windows to behave the same way. NOW it's time for iCloud. Open System Prefs and click on iCloud. After you enter your name & password, be sure to check off all data when it prompts you. Just accept “Find my Mac”, then Login. 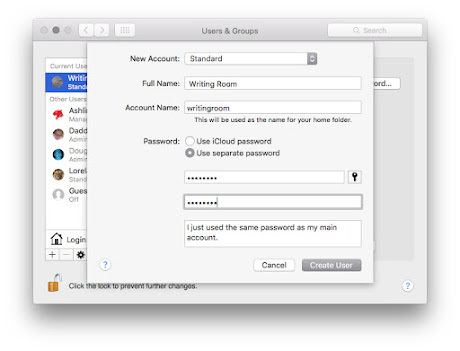 Now return to the System Prefs window, and select iCloud, and select only the services that you'll need. 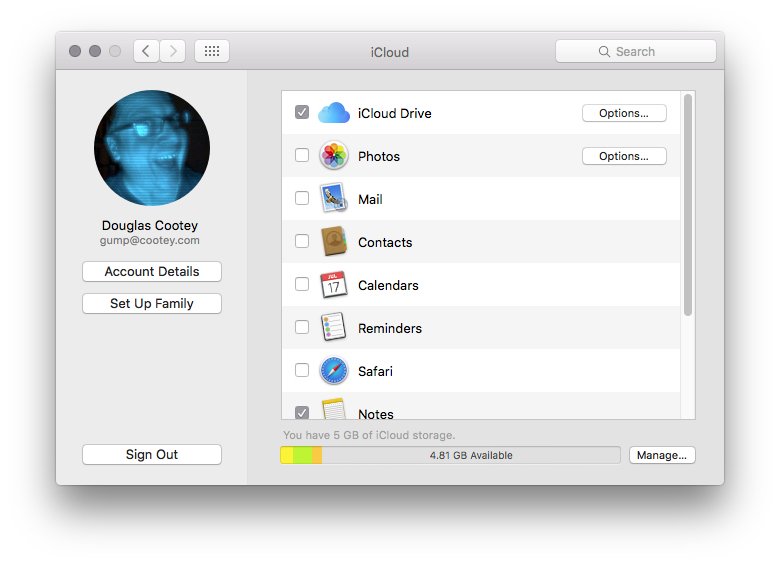 I chose iCloud Drive, Notes, and Keychain. Find My Mac was already selected. You honestly do not need anything else, but it's up to you. In my case, I have my iPhone & iPad to remind me of appointments and phonecalls. 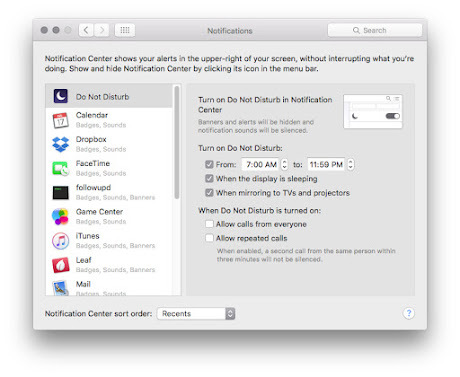 The purpose of this Mac account is avoid all those distractions. Once iCloud Keychain is setup, you may get prompted by Twitter to turn on the account that has been added. Don't do it! In fact, don't enable any social media. This account is for ignoring the world. Let's make sure we aren't disturbed. In System Prefs, click on the Notifications icon. Set Do Not Disturb to be active while you work. I set mine from 7:00 am to 11:59 pm. Next, select each app in the left pane individually and set their notifications to None. You'd think DND would take care of this, but I've found some apps that ignore DND. You will need to revisit this from time to time as you run new apps. 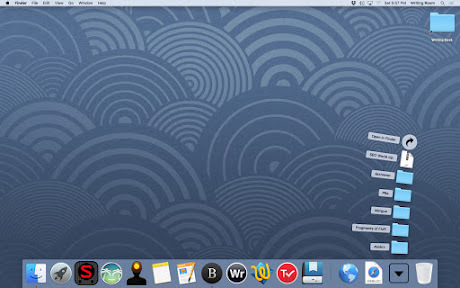 Remove almost every app from your dock. Remove the Downloads folder, too. (You aren't surfing the web in this account, right⸮) I kept Launchpad, Notes & Pages. Right click or Ctrl click on the dock divider line and turn hiding on. (That's my preference. 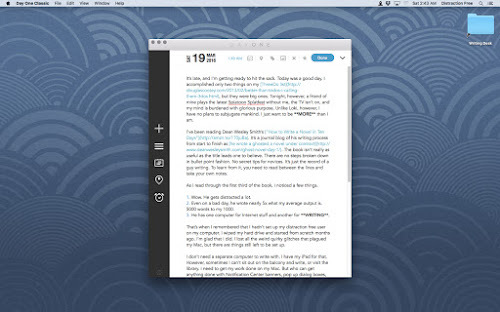 Less visual noise when I'm typing.) 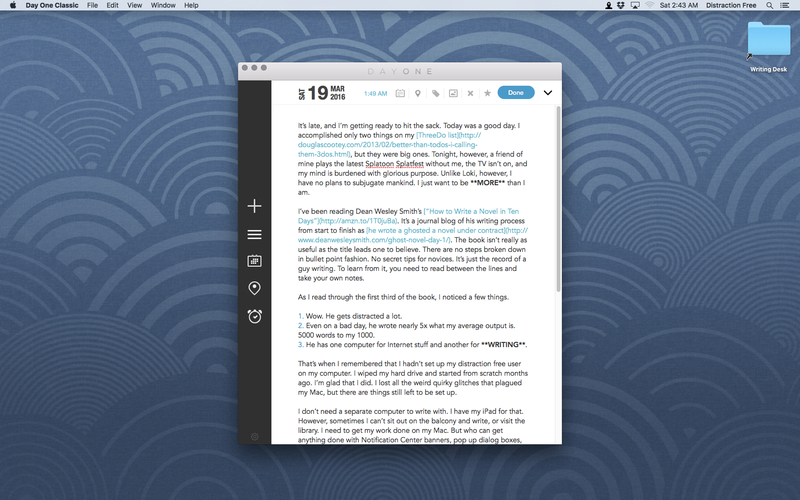 Now add your writing apps to the dock. In addition, I added SomaFM. I didn't want to mess around with setting up a new iTunes music library. I have an iPhone & iPad for my music needs. I also added reminder apps that make me take typing breaks, and keep me focused. Open System Prefs and configure other settings as needed.